The Bridal Cave in the Ozarks of Missouri may be perfect for your wedding venue. Legend has it that in the 1800s, a Native American pair were married here. 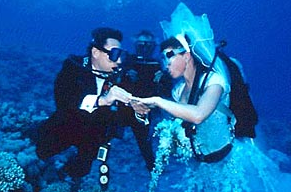 Since then, couples have been having their own unique weddings there. 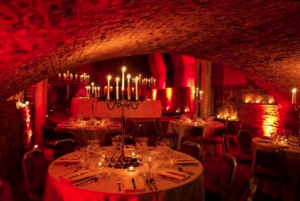 The temperature in the cave is a steady sixty degrees year-round, so ithe perfect solution for escaping the heat of summer weddings. Cruise to Alaska and take a helicopter ride to a glacier for the ceremony. With temperatures around twenty-five degrees in an ice chapel, the bride, groom, parents, and everybody else on the glacier must not just dress for the occasion, but also for the conditions. This includes crampons on their footwear so as not to slip. Brides usually wear a thermal lined floor-length gown, fur-trimmed hood and thick cape. At least the ice benches are covered in animal skins. A volcano will match your burning love. 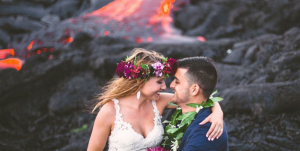 Volcanos can still be active, but not cause alarm and plumes of lava flaring against the sky from a distance create one of the craziest backdrop of any wedding photo. This may not just be one of the craziest places to get married, but also the hottest. 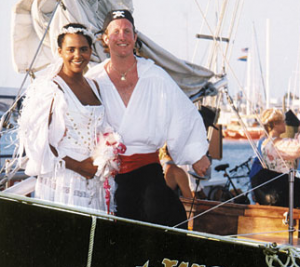 For adventure on the high seas, get captured into marriage on a pirate ship. A fairy tale wedding with your service performed by the captain in full regalia. Getting married on the pirate ship is not just like stepping into a fairy tale, it’s far one of the craziest places for an energetic and fun ceremony and reception. Whilst your marriage ceremony will take place on the boarding platform, your wedding party can look on from their seats on the roller coast. 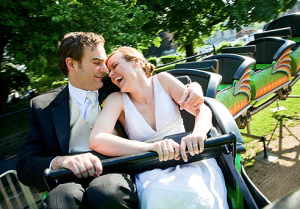 Once you’ve said “I do”, join your party guests on the roller coaster for a scream-inducing, knee-knocking ride. Get married in a one hundred and twenty thousand gallon shark tank, with non-aggressive sand tiger and nurse sharks swimming all around you and coming up to the cage to witness your deep sea dive wedding. The wedding party can stay in the boat with the minter administering the vows via transmitter radio. If you can not decide what to wear on your wedding day, consider a clothing-optional wedding in Florida. At Cypress Cove Nudist Resort & Spa, brides and grooms wear only their birthday suits as they tie the knot on the shore of scenic Lake Toho. The wedding party reception follows at Cheeks Bar and Grill for au naturel dining and dancing.